Large Personalized Square Address Plaque 15x15 - - estate size 15" x 15" square address sign. Personalized with the 3 lines of the text your specify. Made in USA. Wall mount or lawn placement. Line 1 for the house number holds up to five (5) 4.5" characters. Lines 2 & 3 for the street name each hold up to twelve (12) 2" characters. Lawn mount option includes two 18" lawn stakes for convenient set up. Crafted from rust-free recycled aluminum. Specially formulated paints have been weather tested to withstand the harshest elements. Eleven colors (from left to right in small images): AB antique brass; AC antique copper; BG black with gold characters; BS black with silver characters; BW black with white characters; GG green with gold characters; OB oil rubbed bronze; OG bronze with gold characters; PS pewter with silver characters; RG red with gold characters; and WG white with gold characters. 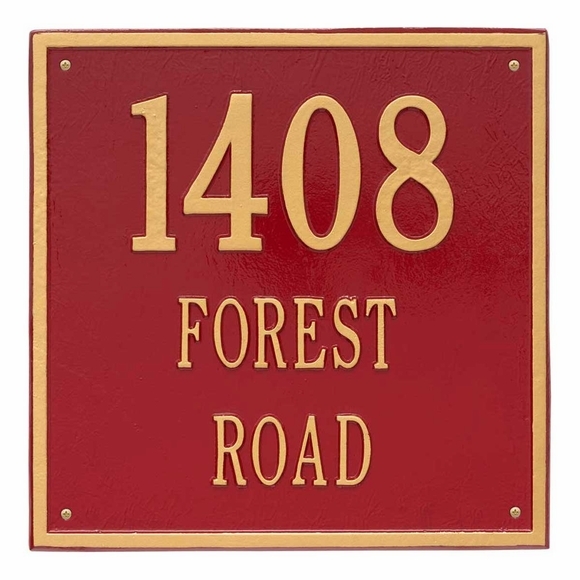 Address shown above: 1408 FOREST ROAD. This sign also comes with 1 line or 2 lines and in medium 11" x 11" and small 6" x 6" sizes (see Related Products). Comfort House is a small independent retailer and manufacturer established in 1991. There are many imitators of our name and original ideas but there is only one Comfort House. Thank you for shopping with us and for shopping small! Entire Site Contents © Copyright 1991-2019, Comfort House, All Rights Reserved.